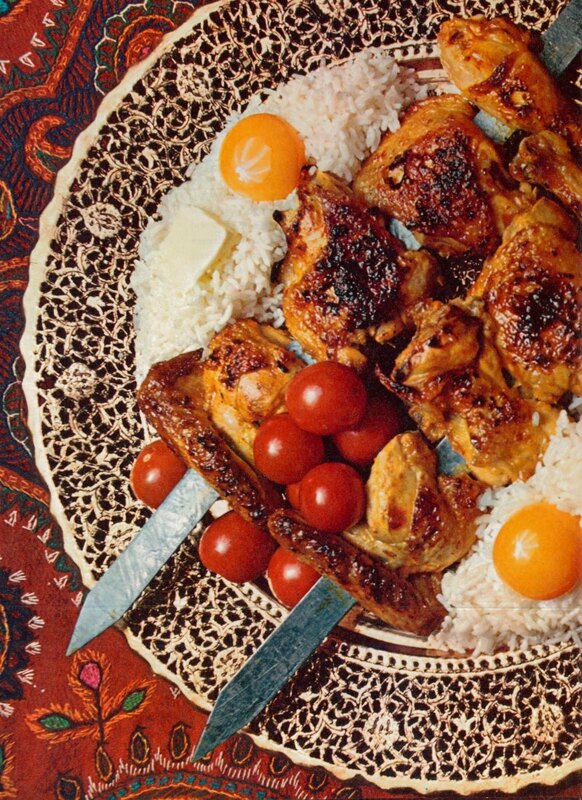 The full photo for this Persian dish was absolutely spectacular; unfortunately, it took up two pages in the book, and the split between those pages took away from the aesthetics - so you get half of the picture. This dish is on my list as soon as I drag my Weber Kettle out of storage for spring; chances are that we will cut it in half, since we will probably only prepare one chicken, or the equivalent, but I expect it to be quite good. A setting of Oriental opulence befits the most princely kebab of all, - Chelo Kebab. The dish consists of broiled meat and rice made rich with raw yolks and butter. This chelo kebab uses crisp pieces of chicken that were marinated in lemon juice, onion and salt before broiling. In a stainless-steel, enameled or glass bowl, combine the onion, lemon juice and salt, stirring until they are thoroughly blended. Add the chicken and turn the pieces about with a spoon to coat them well. Marinate at room temperature for at least 2 hours or in the refrigerator for 4 hours, turning the pieces over occasionally. Light a layer of coals in a charcoal broiler and let them burn until a white ash appears on the surface, or pre-heat stove broiler to its highest point. Remove the chicken from the marinade and string the pieces tightly on 4 long skewers, pressing them together firmly. If you are broiling the chicken in an oven, suspend the skewers side-by-side across the length of a large roasting pan deep enough to allow about 1 inch of space under the meat. Stir the melted butter and dissolved saffron into the marinade and brush the chicken evenly on all sides with 2 or 3 tablespoons of the mixture. Broil about 3 inches from the heat for 10 to 15 minutes, turning the skewers occasionally and basting the chicken frequently with the remaining marinade. The chicken is done if the juices that trickle out are yellow rather than pink when a thigh is pierced with the point of a small, sharp knife. Kababe Morgh is traditionally accompanied by Chelo (link below) and may be garnished, if you like, with tiny, whole cherry tomatoes.